Measurements of forces and moments at the base of the socket began in the 1980s with strain gauges glued to the pylon and then progressed to one-of-a-kind dedicated systems designed specifi­cally for O&P studies in the 1990s.2,3 A commercial load cell was used for studies of transfemoral osseointegration implants in the early 2000s,4 and the same type of load cell was used recently for studies of transtibial prosthesis loading.1 College Park began marketing a load cell intended for O&P research in the latter part of the last decade, and has patented a similar system for clinical use. Around the same time, Orthocare Innovations also began marketing an automated alignment system that uses a small load cell attached to the pylon. 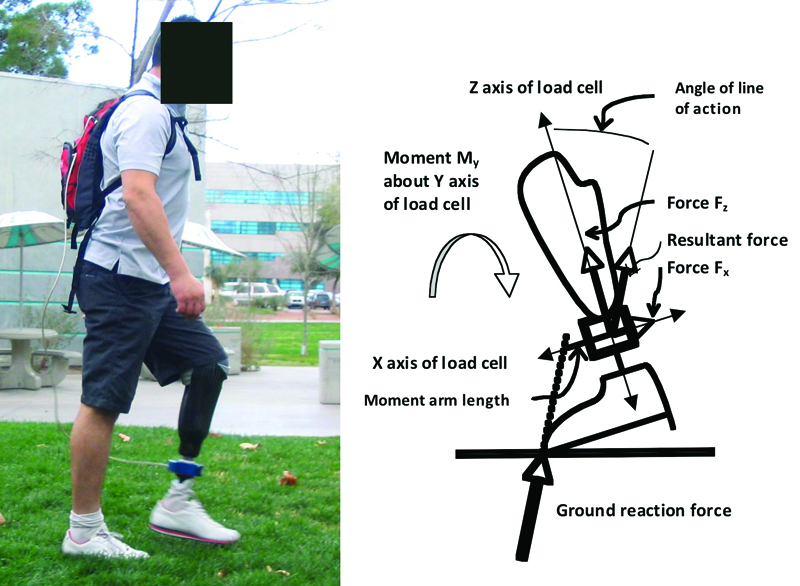 Load cell data have many potential research and clinical applications in lower extremity prosthetics, and the tech­nology offers a low-cost alternative to the conventional gait lab for obtaining many of the kinetic measurements that characterize gait. Figure 1. Left: Positioning of a com- mercial JR3 load cell distal to the socket and proximal to the pylon. Right: Load cell measurements in the sagittal plane include the force components along the X and Z axes, Fx and Fz, and the My moment about the Y axis. The resultant force, the angle of the line of action of the resultant, and the moment arm length can be calculated from these measurements.The Y axis of the load cell is perpendicular to the page. Load cells are made of materials that change electrical resistance under strain. The change in voltage is used to estimate the amount of strain, and from this one can estimate the amount of force that produced the strain. The cells vary in size; the one we have used is approximately 1.5 inches thick, 4.5 inches in diameter, and weighs 1.75 lbs. Normally only one load cell per limb is used for analysis. Data are transmitted wirelessly, which means this type of analysis can be done outside a gait laboratory. Load cell location and mounting. Load cells are placed between the socket and pylon and rigidly attached to both, making it possible to measure the forces and moments occurring at the base of the socket (Figure 1). The forces and moments reflect the interaction of the foot with the gait characteristics of the amputee and indicate how the residual limb is being loaded and is respond­ing to the gait preferences of the amputee. The data provided by load cells include the time-wise magnitudes of the forces and moments with respect to the three axes of the load cell during gait, and can be processed to provide a large amount of information. A load cell’s three axes are perpendicular to each other and measure forces parallel to the axes and moments about the axes. Since the axes are perpendicular to each other, the individual forces and moments measured with respect to them can be combined using the Pythagorean theorem to produce resultants in each of the three planes of gait analysis—sagittal, frontal, and transverse—as well as the overall resultant. For analysis in the sagittal plane, only the force components along the X and Z axes and moment about the Y axis need to be examined. Typical load cell data. Figure 2 depicts typical sagittal plane load cell data for two feet of different design worn by the same transtibial amputee—a SACH (solid ankle cushion heel) foot featuring a relatively soft and short keel, and a popular carbon fiber foot that stores and returns energy as the amputee walks. For both feet, the curve representing force in the vertical, or Z direction, along the pylon exhibits a bimodal hump similar to a conventional vertical ground reaction force. Force in the X direction indicates the anterior-posterior loading of the socket in the reference frame of the prosthesis. The sagittal plane resultant of these forces has been computed and is shown in Figure 2. Y direction forces would indi­cate the medial-lateral loading of the socket, which is not depicted. Figure 2. Representative force and moment load cell measurements. With accurate load cell measurements, the resultant force and moment at the base of the socket in any of the three planes will have nearly the same magnitude as the resultant ground reaction force and moment computed from a force plate using the inverse dynamics method in a traditional gait lab. However, the axes of the load cell remain fixed to the prosthesis as it moves. Because of this, the angle of the resultant with respect to the pylon can be determined easily at any point in time during stance, but the angle of the pylon with respect to the ground cannot be established by load cell data alone. The frame of reference of the load cell requires the analyst to think in the reference frame of the prosthesis, rather than in terms of the floor and walls of the gait lab. Figure 3. Normalized force-moment plots. Force measured by the load cell in Newtons has been divided by body weight in Newtons, and moment measured by the load cell in Newton-meters has been divided by the mass of the body in kg. Arrows indicate the progression of stance from heel contact to toe off. Top: On the SACH foot plot, point A indicates a dead spot on the foot—as stance progresses, the length of the moment arm changes little, though force increases and moment increases linearly with force. Point B indicates premature foot-flat—the length of the moment arm increases rapidly in a direction anterior to the pylon without much change in the magnitude of the force; the force peak occurs after the resultant force line of action has passed through the center of the load cell. 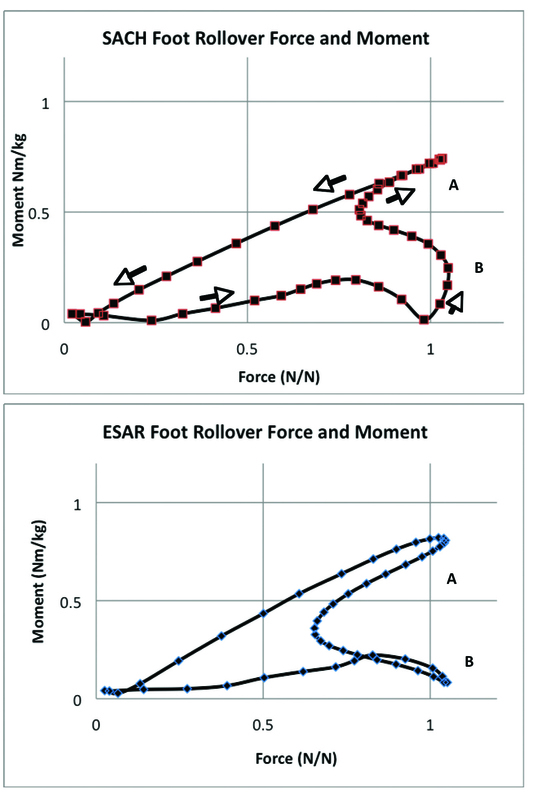 Bottom: On the ESAR foot, the region around point A indicates an increase in the length of the moment arm as the force increases and the relationship is nonlinear. Point B indicates good rollover with the length of the moment arm gradually increasing in a direction anterior to the pylon as the force decreases; the force line of action has passed through the center of the load cell at approximately the same time as the occurrence of the peak force. Advantages of load cell measurements. The load cell offers several advantages over the conventional gait lab. It does not require the use of reflective markers and specialized expertise to collect data, which are major sources of variation among gait labs and among researchers.5 It does not require the use of inverse dynamics and assumptions about the centers of joint rotation to estimate forces and moments at the base of the socket. Load cells are relatively inexpensive compared with conven­tional motion capture and force plate systems and can be used to collect data in a variety of environments for a variety of activities outside of the gait lab. 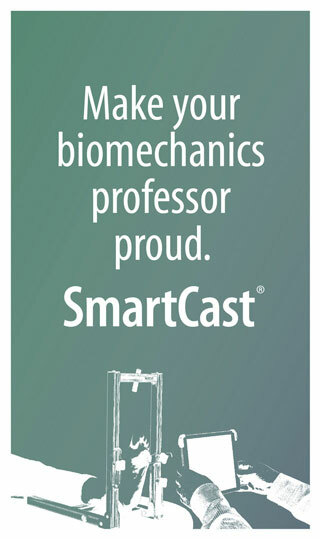 However, the measurements that can be obtained from them do not include walking speeds (since this involves distance covered), gait symmetry in unilateral amputees (since this would require measurements on both limbs), or energy storage and return (since this can be determined only by in vitro testing of feet with laboratory equipment). But load cell mea­surements can provide information on time-related parameters of gait, including stance duration, swing duration, and cadence. Plots of force versus moment. It can be difficult to discern the differences in the loading patterns of feet by looking at the data as presented in Figure 2. Figure 3 provides an alternative way of examining load cell-derived foot loading data that features a plot of normalized force versus normalized moment as stance progresses. This plot makes it easier to contrast the differences between loading patterns and simultaneously provides information on the magni­tudes of the resultant force, moment, and location of the line of action of the resultant force as it progresses from the heel to the toe. To normalize the data, forces have been divided by body weight (in Newtons) and represent percent of body weight. Moments have been divided by body mass (in kg) and represent Nm/kg. The curve shows the time-wise variation of moment with resul­tant force during gait, and the slopes of lines connecting the origin to points on the curve indicate the distance from the load cell at which the force is acting on the foot; that is, the length of the moment arm at which the resultant force is being applied along the A-P axis of the load cell. The steeper the slope, the greater the length of the moment arm. The magnitude of the normalized resul­tant force indicates how aggressively the amputee is using the foot, and the magnitude of the moment is a function of both the magnitude of the resultant force and the distance out on the keel of the foot where the load is being applied. The straight lines can be drawn on the plots, or a straightedge can be used to visualize their location. If successive points on the curve lie on a straight line that connects the curve to the origin, it is an indication that the loading point on the foot is progressing very little toward the toe during rollover, and the foot may be exhibiting a dead spot. An example is shown for the SACH foot in Figure 3. Each dot represents 2% of stance, and the timing of events during stance can be determined by the percent of stance represented by the dots. The timing of the first peak of resultant force with respect to the timing of the minimum of the moment indicates whether the resultant force is passing near the center of the load cell prior to the first peak, during the first peak, or subsequent to the first peak. If the moment reaches a minimum prior to the first force peak, it suggests possible premature foot-flat since the first peak is occurring anterior to the pylon and further toward the toe than the heel. An example of this is also shown for the SACH foot in Figures 3 and 5. Figure 4. Angle of line of action with respect to the pylon versus force. Stance progresses from right to left on the plots, as shown by the arrows. Top: With the SACH foot, the angles of the line of action with respect to the pylon are small and change little comparing the first and second peaks of force. Bottom: With the ESAR foot, the angles of the line of action are larger and distinctly different for the two peaks of force. Plots of force versus angle of line of action. Figure 4 plots the angle of the line of action of the resultant force with respect to the pylon, or Z axis of the load cell, for the intervals near the peak loading of the residual limb during stance. Given the location of the line of action of the resultant force along the load cell’s A-P axis and its angle, the line of action can be extended to determine where the center of pressure is occurring on the prosthetic foot and the location on the keel where the foot is being loaded. 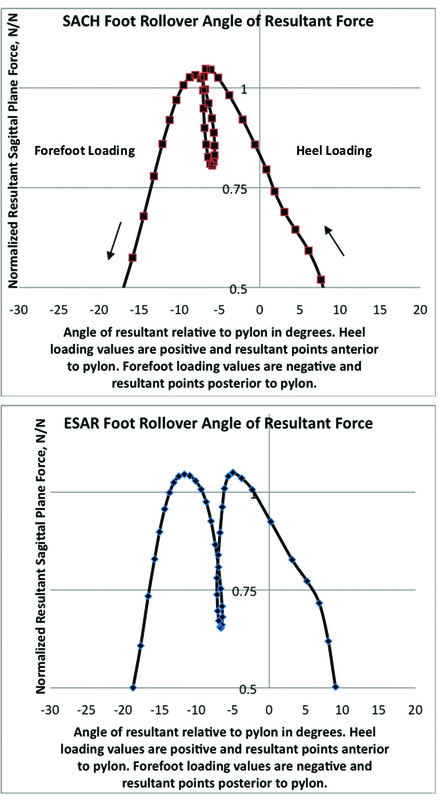 This, in turn, indicates how much of the keel length is being utilized for energy storage and release on an ESAR (energy storage and return) foot, which could influence the performance of the foot and amputee perceptions of rollover.6,7 It reveals what regions of the keel are being loaded during the two peaks of the resultant force, which can be used to examine the extent to which an amputee is able to utilize the ESAR design characteristics of a foot. 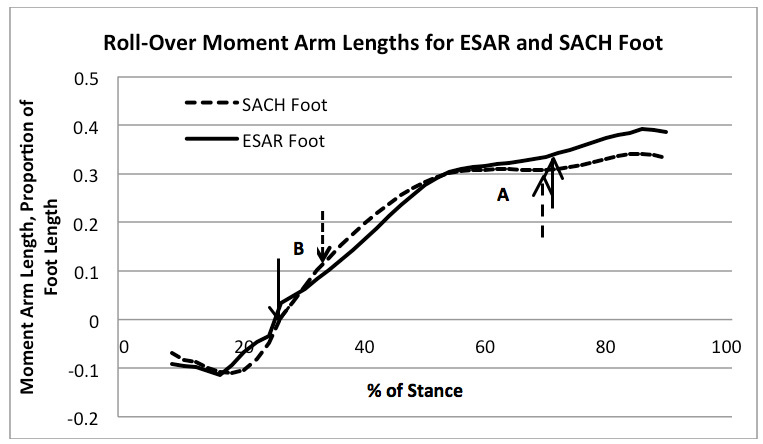 In Figure 4, at the second force peak, the moment arm length is 0.308 of the foot length (24 cm) with the SACH foot and 0.334 of foot length with the ESAR foot, which is an increase of about 8.4%. Remember that this is computed along the axis of the load cell. 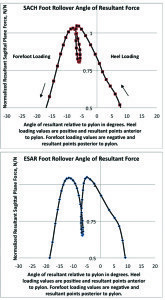 The angle of the resultant force during the second peak is -8.0° for the SACH foot and -11.7° for the ESAR foot with both lines pointed toward the toe. Thus, the line of action for the ESAR foot is not only located further toward the toe compared with that of the SACH foot but also is sloped more steeply and will intersect the X axis further out toward the toe. We did not measure the height of the load cell, but assuming it is 15 cm off the ground, at the point where the foot contacts the ground the effective lever arm for the ESAR foot would be approximately 1.5 cm longer than for the SACH. So one could assume around 1.5 cm more of keel length is being used for energy storage and return during the second peak with the ESAR foot. An estimate of the keel moment arm length is about 11 cm anterior to the center of the load cell parallel to the X axis for the ESAR foot at second peak and around 9.5 cm for the SACH (assuming a 15-cm load cell height above the forefoot). 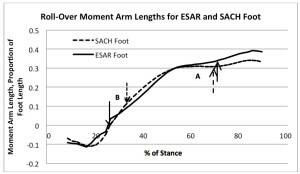 As stance progresses toward toe-off and the end of the curves in Figure 4, the differences between the SACH and ESAR foot moment arms become even greater. Plots of effective moment arm. Figure 5 indicates how the length of the moment arm along the A-P axis of the load cell is related to percent of stance and when the peak loads occur. By comparing different feet used by the same subject, insight can be gained into whether the feet are exhibiting similar rollover charac­teristics, as we have shown. By comparing different subjects using the same foot, insight can be gained as to whether response to a particular foot design is similar among amputees. Figure 5. Percent of stance versus length of moment arm. Negative values indicate a moment arm toward the heel, and positive values indicate a moment arm toward the toe. The region around Point A indicates the dead spot on the forefoot of the SACH during roll-over – the length of the moment arm does not increase. In comparison, the length of the moment arm continues to increase for the ESAR foot. The region around Point B indicates the premature foot-flat of the SACH foot – the length of its moment arm is greater than that of the ESAR foot during early midstance indicating more rapid progression of the line of action toward the toe. Note that a greater proportion of the length of the keel of the ESAR foot is utilized during late forefoot loading. The arrows indicate the times when the 1st and 2nd peak resultant forces occur for each foot. Since measurements can be taken outside of the gait lab, load cells can be used to measure rollover characteristics for many everyday activities, such as walking up and down ramps and steps, and could be used to measure rollover during walking across slopes. The effects of prosthesis alignment on rollover also can be examined. A-P and M-L linear movement of the foot, rotation of the foot, and changes in the flexion angle of a socket will alter the rollover pat­terns of the forces and moments experienced at the socket. This may enable comprehensive theories of alignment to be developed based on both the rollover shape of the foot and the kinetic variables measurable with a load cell. Since load cell data capture rates are known, the percent and amount of time spent in stance and swing on the prosthetic limb can be computed easily. Cadence can be similarly computed. Also, previous research indicates that a strong relationship exists between the forces and moments measured at the base of a socket and the pressures that the amputee experiences on the residual limb inside the socket.2 The portion of the residual limb that is inside the socket both resists and generates the external loads on the foot and delivers the forces necessary to walk, which manifest themselves as pressures generated where the residual limb contacts the socket. Models that estimate intrasocket pressures using load cell data potentially could be useful for examining the ground reaction force loads that are transmitted to the socket and their effects on the residual limb. Given the significance and usefulness of the information that a load cell can provide the clinician, its use for measuring and diagnosing amputee gait is likely to grow. 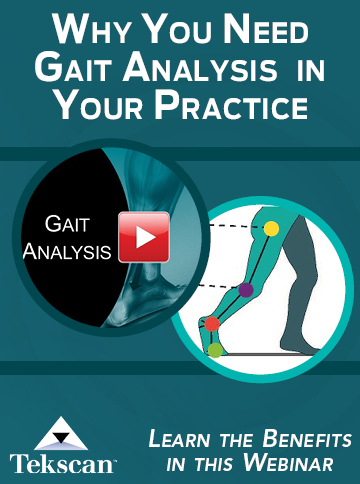 Improved gait assessment represents an area of O&P clinical practice that is ripe for increased use of scientific instrumentation, provided the cost of measurement can be kept low and the instrumentation is easy to use, the data are reliable, and analysis of the data can be undertaken quickly with little special training. The load cell appears to offer opportunities for this. The analytic capabilities of load cell software will continue to evolve, and the costs of instrumentation are likely to become very competitive with other tools of gait assessment that can be implemented in the clinic. 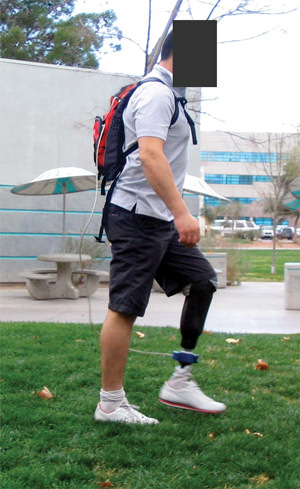 t­ment of Mechanical Engineering at UNLV and conducted thesis research on the use of load cells to quantify amputee gait. Joon S. Lee, PhD, is an associate research professor in the Department of Mechanical Engineering at UNLV and specializes in robotics. Disclosure: The research reported was funded by the US Army Medical Research and Materiel Command, Project W81XWH-07-2-0084. 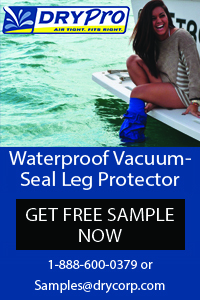 The authors have no financial interests in any of the products, devices, or companies mentioned in the article. 1. Neumann ES, Yalamanchili K, Brink J, Lee JS. Transducer-based comparisons of the prosthetic feet used by transtibial amputees for different walking activities: a pilot study. Prosthet Orthot Int 2012;36(2):203-216. 2. Winarski DJ, Pearson JR. Least-squares matrix correlations between stump stresses and prosthesis loads for below-knee amputees. J Biomech Eng 1987;109(3):238-246. 3. Sanders JE, Daly CH, Burgess EM. Clinical measurement of normal and shear stresses on a transtibial stump: characteristics of wave-form shapes during walking. Prosthet Orthot Int 1993;17(1):38-48. 4. Frossard L, Beck J, Dillon M, Evans J. Development and preliminary testing of a device for the direct measurement of forces and moments in the prosthetic limb of transfemoral amputees during activities of daily living. J Prosthet Orthot 2003;15(4):135-142. 5. Gorton G 3rd, Hebert DA, Goode BE. Assessment of kinematic variability between 12 Shriner’s motion analysis laboratories. Gait Posture 2001;13(3):247. 6. Hafner BJ, Sanders JE, Czerniecki JN, Fergason J. Transtibial energy-storage-and-return devices: a review of energy concepts and a proposed nomenclature. J Rehabil Res Dev 2002;39(1):1-11. 7. Hafner BJ. Clinical prescription and use of prosthetic foot and ankle mechanisms: A review of the literature. Prosthetic foot/ankle mechanisms. J Prosthet Orthot 2005;17(4):S5-S11.